Zainab Chottani is a growing name in fashion industry of Pakistan as she is best in making clothing of all range like prêt wear, embellished bridal dresses, casual and formal wear etc. Zainab Chottani clothing brand has gained enormous reputation in dresses of brides globally along with her overstated couture of heritage as they make all her dresses with lavish fabrics in form of both soft and bold hues. 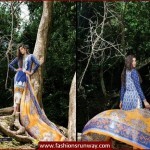 Recently Zainab Chottani and Lakhani Silk Mills teamed-up and launched its summer lawn 2015 collection for women. Now Zainab Chottani is introducing her new arrival for Eid Festival of the year especially for ladies and when these ladies will wear these clothes their personality will look more fashionable and stunning. All eid dresses are up to date and modern and she presents her collection through Lakhany Silk Mills (LSM) with sixteen different design, style and stuff that brings a diverse change which astonishes all ladies as these dresses looks so prominent, delicate and full of bright colors. LSM Fabrics Zainab Chottani Eid Collection 2015 are all adorned in printed pattern as well as also she used different designs of motifs. Each shirt is decorated with chicken laces and floral motifs on front daaman and on shirt neckline the motifs are done and in some shirts it is designed on center of the shirts. These all apparels are looking stunning as these suits are sewed with stylish designs. Now a days the different designs are in like both long & short shirt with trousers, tights and churidar pajamas and all this is followed by Zainab Chottani Eid collection 2015. 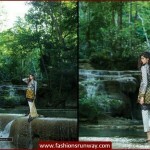 Zainab Chottani previous dresses were made by Shariq Textiles as it is also a reputed textile among others but first time she designed her Eid Collection. Styles of stitching are outstanding as these gives traditional designs along with contemporary cuts which have been used in her collection. Check below here Lakhani Silk Mills new eid collection 2015 under the title of Zainab Chottani designer lawn eid dresses 2015.